Northwest Integrity Housing Co. and Thomas Development Co. announced today the development and construction of Bandon River Apartments, a senior apartment community located within Snake River Landing in Idaho Falls. Ground was broken in July, and the first unit is expected to open in the first half of 2014. 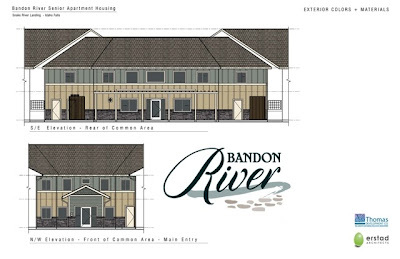 Bandon River will offer rental housing for eligible individuals over age 62. It is part of the second phase of residential development within Snake River Landing, following the construction of 34 single-family homes. Snake River Landing plans several other home types and residential options within its 400 acres. “Building a new apartment community in Snake River Landing is an exciting opportunity for us to expand our eastern Idaho business platform,” said Tom Mannschreck, president of Thomas Development Co. and Northwest Integrity Housing Co.
Thomas Development Co. has developed Rosslare and Summerhill Apartments, as well as the Earl Building and 357 Constitution Plaza in Idaho Falls. “Our company takes great care to select the best locations for our apartment communities. Snake River Landing exceeds our selection criteria,” he said. For more information about the Bandon River apartments, please call Thomas Development Co. at (208) 343-8877. Sounds like a plan. I've heard these Senior living housing projects are very successful in providing the elders with an appropriate home. The people in there must be enjoying much because of the many activities that you give them. I'm looking for 55 and over communities on long island that has facilities that encourage their occupants to engage in outdoor activities. Those things are really helpful for a healthy living.